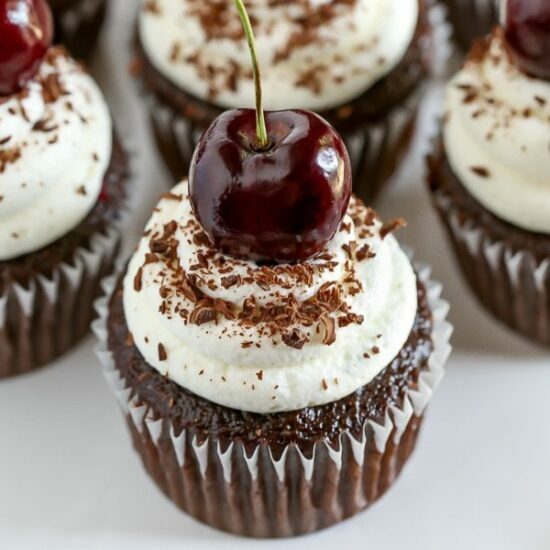 These Black Forest Cupcakes feature soft, light, and moist chocolate cupcakes with a cherry filling and are topped with a homemade whipped cream. Taste: Chocolatey with hints of cherry and the whipped cream is perfect! Texture: Soft and light and the cherry filling is a fun surprise! 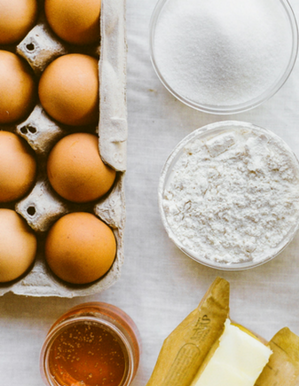 Ease: These cupcakes are a little time consuming, but definitely worth it. 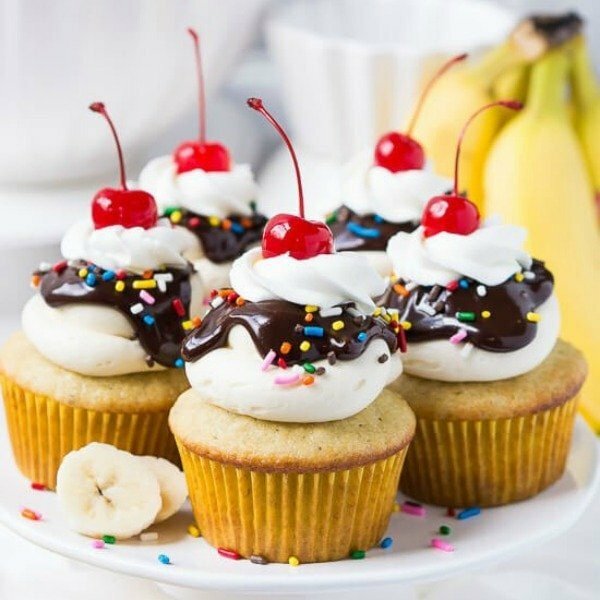 Appearance: The whipped cream, chocolate, and cherry on top of these cupcakes makes them so cute! Cons: A little time consuming. Would I make this again? Definitely! When I was growing up, my grandmother used to always bake a black forest cake for birthdays. Although my family tends to celebrate birthdays with a cheesecake now days, black forest cakes have always held a special place in my heart. 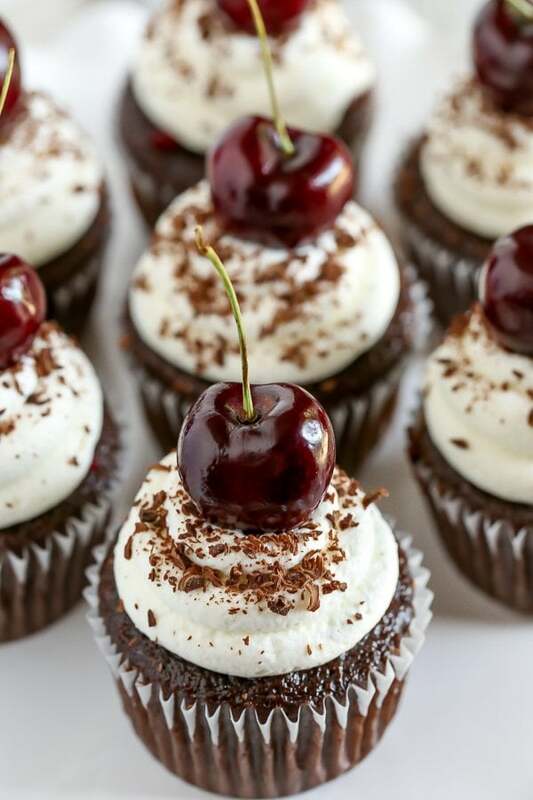 So, I decided to transform her favorite cake into these adorable Black Forest Cupcakes. I’ve made a lot of cupcakes, from lemon raspberry to pumpkin, but these Black Forest Cupcakes are one of my favorite creations so far. Everything is made completely from scratch, even the cherry pie filling in the middle! 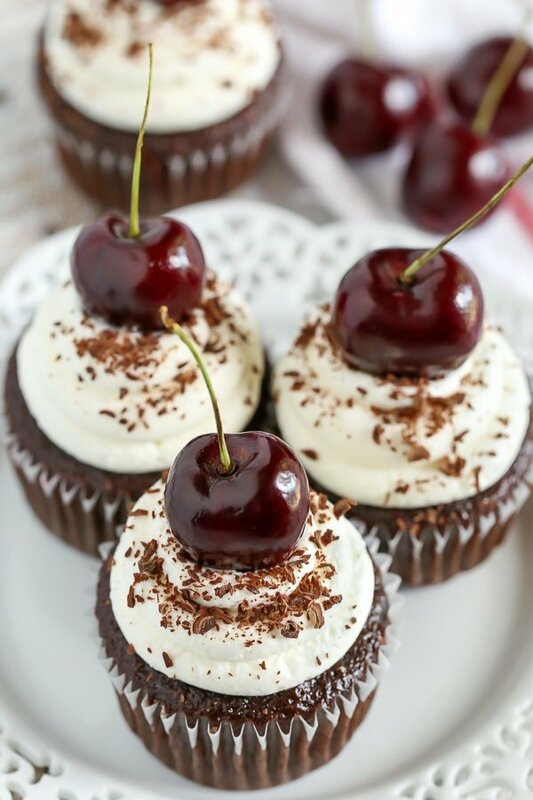 The base of these Black Forest Cupcakes starts with my favorite chocolate cupcake recipe. Not only are the cupcakes soft and light, but they stay moist for days. Can you tell from the picture how moist the cupcakes turn out? Seriously, so good. Once they’re baked and cooled, you’ll cut out the center and fill each one with some cherry filling. Speaking of that cherry filling? Making your own cherry pie filling at home is easy and it tastes a million times better than anything you can get out of a can. In fact, I had my husband taste test the filling and he absolutely despises cherry filling from a can. The verdict? He actually really liked it! I think you will too. I used sweet red cherries in the filling, since I wanted to top the cupcakes with them as well. You can easily use another type of cherry in this recipe, just adjust the amount of sugar to your personal preference. One thing to note is that you’ll need to slice the cherries in half before measuring them out and making the filling. I felt like the smaller pieces of cherries worked much better to fill the cupcakes, since some cherries can be kind of large. Also, you will need to pit the cherries. Does anyone else absolutely hate pitting cherries? I don’t own a cherry pitter, but I actually use a sturdy plastic straw. Just push the straw up through the center of the bottom of each cherry and it will remove the pit and stem. So easy! Lastly, there’s the homemade whipped cream. There is some unflavored gelatin in the whipped cream recipe, but it’s just there to stabilize the whipped cream. Have you ever noticed that whipped cream can sometimes fall flat after so long? The gelatin helps to prevent that and keeps the piped whipped cream on top of your cupcakes perfectly in place for days. If you don’t have any unflavored gelatin or prefer not to use it, you can simply leave it and the water out of the whipped cream recipe. The whipped cream won’t hold up as long, but it will still taste just as good. Enjoy! Preheat oven to 350°F. Line two 12-count cupcake pans with 16 cupcake liners and set aside. In a large mixing bowl, sift together the flour, cocoa powder, baking powder, baking soda, and salt. Whisk in the granulated sugar and brown sugar until well combined. Add in the oil, egg, vanilla extract, and buttermilk and mix until just combined. Add the instant espresso powder into the boiling water and mix until dissolved, then add to the mixing bowl. Mix with the rest of the ingredients until well combined, making sure not to over mix the batter. The batter will be thin, this is okay. Evenly distribute the batter between all 16 cupcakes liners, making sure to only fill them a little over half way full. 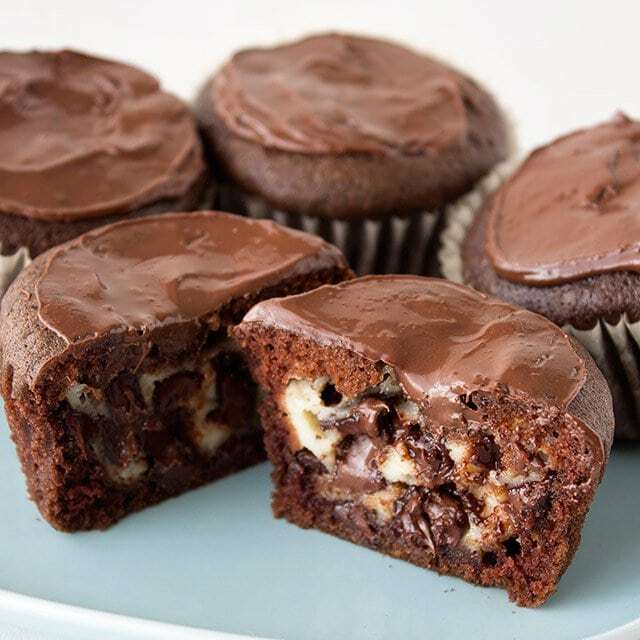 Bake at 350°F for 18-20 minutes or until a wooden toothpick inserted into the cupcakes comes out clean. Remove from the oven and carefully remove the cupcakes from the pan. Transfer the cupcakes to a wire rack to cool. Add the cherries, granulated sugar, lemon juice, water, and corn starch to a saucepan and mix until well combined. Heat over medium heat, stirring often, until the mixture has thickened. Remove from the heat and stir in the vanilla extract, then set aside to cool. Pour the water in a small bowl and sprinkle the unflavored gelatin on top. Allow to sit for a few minutes. Transfer to the microwave and microwave for a few seconds until the gelatin has dissolved. Stir well and set aside to cool for a few minutes. In the bowl of a stand mixer fitted with the whisk attachment, or in a large mixing bowl using a hand-held mixer, add the heavy whipped cream, powdered sugar, and vanilla and mix on medium speed until it starts to thicken. Turn the mixer to low, slowly pour in the gelatin, then continue mixing at medium-high speed until stiff peaks form. 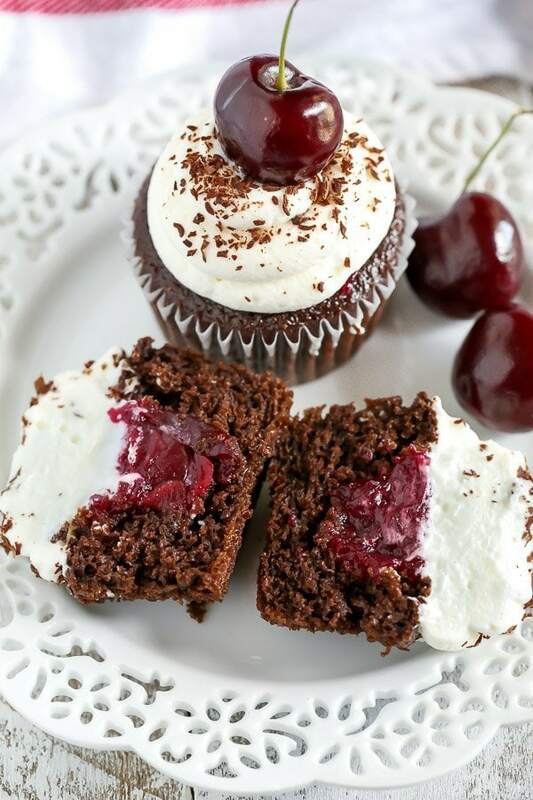 Once the cupcakes and cherry filling have cooled, use a knife to cut out a hole in the center of each cupcake. Scoop about 1-1.5 tablespoons of the cherry filling into each cupcake. Then pipe the whipped cream on top. Garnish with chocolate shavings and a cherry on top! how do you not have a cherry pitter?! every baker should have a pitter – i guarantee it’s easier than a straw. go order one! 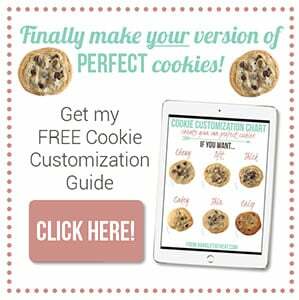 i’m a new subscriber to your blog and I am just LOVING all your recipes. Haven’t made one yet but I’m getting so many good ideas! Love it! Thanks! Haha, maybe I do need to go buy one 🙂 I can never remember to just go buy one until I’m actually pitting cherries and realize how nice it would be to actually have one. I’m sure it’s definitely much sturdier than a straw! Hi Amal, so sorry for the delayed response I must have missed your comment! It may work with strawberries, but I haven’t tried it yet so I can’t say for sure how the filling would turn out. You could try filling them with strawberry jam or preserves? If you do try strawberries, I’d love to hear how it turns out! I was wondering if there were an alternative to using espresso powder in this recipe. Espresso irritates my stomach and if I could find an alternative or omit it all together that would be ideal. How important is the espresso powder to the recipe? Hi, Taylor! The espresso powder is just there to enhance the chocolate flavor, you can leave it out if you like. You could also replace the water and espresso powder with 1/2 cup of hot coffee, but just using 1/2 cup of boiling water will work fine. Hi! The recipe looks yumm!! Just a quick one question can I use the frozen store bought cherries? ?the tart cherries?? I think frozen cherries would be fine. I would increase the sugar just a bit, since I used sweet cherries for this recipe. And also if I want to use this recipe to bake a cake which pan size shall I use?? You can bake a single layer cake with this recipe. I use a 9″ cake pan and bake at 350°F for about 30 minutes. You’re welcome, Mariam! As far as your cream, I’m honestly not sure. The gelatin in this recipe is what really helps to keep the shape if you’re piping the whipped cream. It may be good to have some gelatin on hand if you’re planning to pipe some on the cake. Thank u soo much for such an amazing recipe once again..I made that the other day n everyone loved it!!! That’s wonderful to hear, Mariam! I’ll keep your suggestion in mind too. 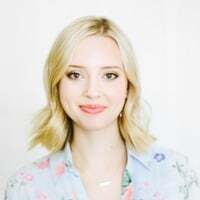 Hi Danielle! 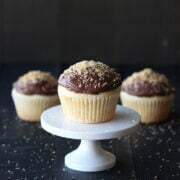 I’m planning on making this recipe tomorrow and was thinking of doing the frosting/piping on top a little differently. I’d like to pipe the whipped cream frosting around the edges and then add more of the cherry filling in the center on top. Do you think the frosting is sturdy enough to support that? And should I double the recipe for the cherry filling? Thanks in advance and thanks for a great recipe! The cherry filling is kind of thick, so I think that should be fine to do that. You can always test it out on a cupcake or two and see how it holds first. Also, I used about 1-1.5 tablespoons of the filling in each cupcake. If you want more than that on top of each one, then I would definitely double the cherry filling recipe too. Hope that helps! 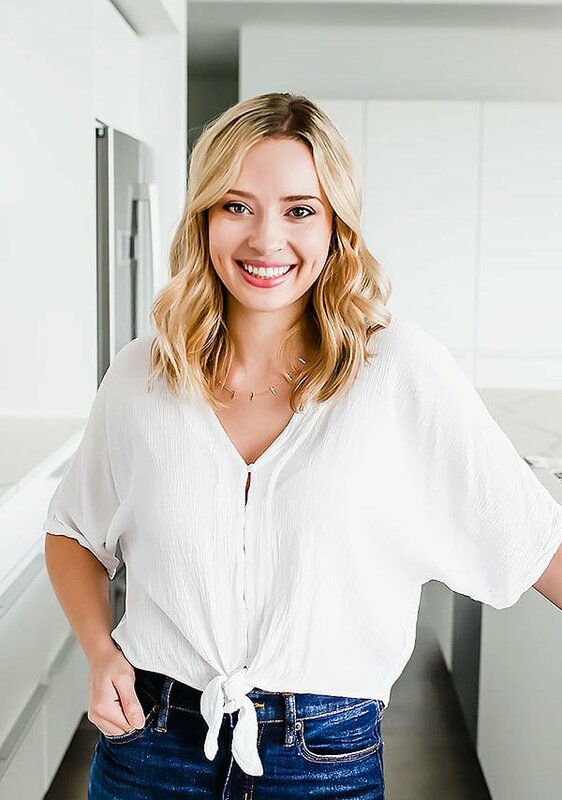 Hi Danielle i love the recipe however am a bit confused…whats the different between baking soda and bicarbonate of soda? I looked everywhere for a baking soda but i can’t find it i only find bicarbonate of soda. Is it the same thing? Hi Danielle..I am thking of making these for my daughters international day at school as her class is representing Germany.I was thking of piping the whipped cream on the cupcakes at night so that I dont have to rush in the morning..will the whipped cream survive that long? As long as you use the gelatin to stabilize the whipped cream, it will hold it’s shape. Hope you enjoy the cupcakes! Is it possible to use kirsch in the cherry filling? I just made these and they are so good! Next time I’ll cut the cherry filling in half, I had a lot of leftovers. But the cupcakes had such amazing texture, definitely one of the best textures of cupcakes I’ve ever made, and great flavor. Thank you for the great recipe!